There is nothing better than a good guided hunting trip and few things more frustrating than a bad one. Do some research prior to handing money over to an outfitter by speaking to individuals who have hunted with them about their experiences. You will know if something sounds fishy, and it's a red flag if an outfitter won't produce contacts. For these trips, check out Getducks.com and Ramsey Russell. Manitoba is a waterfowler's dream. Everybody knows about the great duck and goose hunting this province offers, but what many hunters from the States don't know is how great the hunting for Sandhill cranes is here. The province offers some amazing opportunities to hunt what is arguably, one of the tastiest birds out there so good, in fact, that many have nicknamed these birds the "ribeye in the sky." Sandhills decoy well and there are a number of outfitters in the province offering hunts. So, whether you want to extend your duck- or goose-hunting adventure to Manitoba or want to go there just try your hand at these birds alone, check out the amazing opportunities for Sandhills just over the border in Canada. 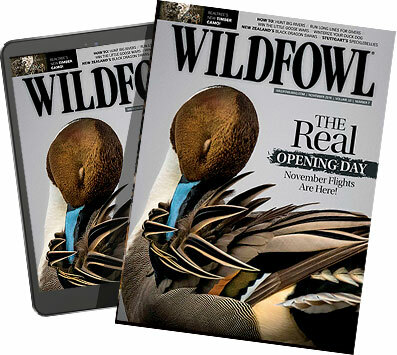 You may not feel like a complete waterfowler if you haven't at least dreamed of going after a tundra swan, and the go-to place to do it is North Carolina, where some outfits run success rates close to 100 percent. The Mattamuskeet Refuge area is the hub of hunting North America's largest legal waterfowl. It's a simple outing and affordable for this ultimate trophy. An average duck hunt run's $550 to $600 with lodging per day for up to three guys, so you and a few buddies can have a three-day package and that's about all each of you will pay in the end. "My kid out there mowing grass this summer could afford this hunt. Go for two or three days, so you can pick a nice mature bird and enjoy it," Ramsey Russell of Getducks.com says. "Instead of seeing a few you will see hundreds if not thousands, and when you get your swans you can chase pintails, scooters, long-tails and all kinds of fun stuff." Experience boat blinds for decoying ducks in the shallow flats, true traditional East Coast tidal hunting. It's the place to go to get your hand on a beautiful plumed out swan for taxidermy in January. Historic Chesapeake gets all the hype, and Delaware Bay is not on the radar of many waterfowl hunts, but it should be. One of the biggest bodies of water on the East Coast is home to massive ledges where deeper waters come right up to oyster shoals and the hunting is terrific for white-winged, surf and common scoters. Experience classic layout boat hunts, with plenty of cool options if the weather gets too rough for sea ducks. Chase mallards, geese, black ducks or brant, or score that trophy long-tail in a place that also has plenty of Eastern Shore-style Canada goose hunting. "We quit booking Maine because weather can screw you up so quick and there's not much you can do when you can't chase sea ducks," says Russell. It's a good trip to bring spouses along, because it is surrounded by civilization, yet it has fantastic hunting and is off the beaten path, without the pressure of the famed bay to the south. An affordable hunt at $250 to $300 per day, and it's not too expensive to get to, because any major airline flies to Baltimore or Washington D.C. When guys say "greenheads" the Northwest is not the first place that comes to mind yet. Editor Skip Knowles cut his teeth on mallards in the Columbia Basin, with absolutely no idea how good he had it. With a seven greenhead limit and tornadoes of pintail, wigeon and Canada geese flocking through eastern Washington, this is one of the most consistent bets in the country. Russell's waterfowl hunts run $350 a day and for $1,500 you can get lodging meals and everything for a three-day duck hunt. There are many reputable outfitters at all levels hunting Washington on both public and private lands. Thousands of acres of impoundments and standing flooded corn are routine on private lands, and you can bring your boat and hit the Columbia, McNary and other spots scattered around the big river's many refuges. Southern Idaho is often a short stopper of greenhead flocks and can be excellent, too. Public opportunities in the Deep South are getting tougher, but private land waterfowl hunts with outfitters are becoming more affordable, and this is a place you just have to experience. Duck country down here is so different from the rest of the U.S., with some of the best dirt in the nation in regions with the lowest, wettest spots imaginable, places where rivers come together and the flooding creates some of the best habitat in the world. Cypress breaks, ag fields and flooded impoundments host mallards, gaddies, teal, wigeon and just about everything else. For $350 a day in Tallahatchie County you can stay in an antebellum plantation home and enjoy top-notch meals and drinks on the delta, where in spots so many mallards trade back-and-forth at eyeball level around the refuge you won't believe it. Mississippi is simply full of great guided duck hunts at all levels. Come pay homage to the duck motherland, a place that produces birds, stages birds, and funnels millions of spring snows when they come back through. If the snows get stalled due to weather, you're in for the waterfowl hunt of a lifetime. Russell doesn't book North Dakota trips but does make referrals and that Devil's Lake region is something special, he says. Where else but NoDak can you legally hammer 15 Canada geese in the month of August? For $350 a day, you can have British Columbia-style bag limits. Nobody is shooting 15 Canadas per man per day (the birds are just too tough to dial that efficiently) but some of the guys have killed 10 or so apiece. "Six of us shot 65 big resident birds one day, so it happens," Russell says. Great mallard hunting is a given in central ND, and the state's laws are set up so outfitters have to play by many of the same rules as regular hunters. "It's a mighty damned big state," Russell says. "I know guys going out there for 15 years who still get off the beaten path far enough to avoid competition." One of the best kept secrets for years, a sandhill crane hunt on the Texas Panhandle is at the top of our list. Thousands of tiny glacial lakes left after the Ice Age are scattered across terrain now surrounded by countless acres of beef country full of wheat corn, milo and soybeans. The result: a vast and beautiful habitat. Some lakes have ducks, others geese, still others cranes. Most lakes offer a mixed bag of teal, wigeon and mallards right at daybreak and then geese are the late arrivals doing their thing along with the cranes. "A guy can go out and shoot ducks, geese and score a bonus crane on any day," Russell says. "Texas has always been the place to go to shoot cranes and it hasn't slowed a bit." Affordable, from $250 a day and up. For duck and goose hunters, this is a paradise, and it's no longer a secret. Kansas duck hunts have been getting lots of attention because the central area is simply unbelievable, and guided hunts are reasonable at $300 to $350 a day with lodging for skies with mallards, teal and wigeon. Goose hunts can get legendary in a hurry when flocks group up en masse, and the limits are relaxed by U.S. standards. There is good public hunting at Cheyenne Bottoms and Quivira (among others) for those willing to do their homework, and some of the country's best gunning for wild upland birds if you like to chase prairie chickens, pheasants and quail for afternoon fun. The state has a wonderful cooperative private land farming (WIHA is a program fro public-private hunting) that can turn up some gems, too. Kansas is now definitely on the list of places you need to visit for your next duck hunt. Stuttgart? Sure, you gotta do it. But there is so much more to Arkansas. Example: One of Russell's favorite duck hunts is just over the border heading north out of Monroe, Louisiana, where a wide spot in the road called Wilmont, Arkansas, just may be near heaven for the duck man. It hardly has a place to eat, but one of his outfitters has 300 acres located in the middle of a 6,000-acre federal sanctuary, a few hundred yards from where 100,000 mallards sit all day long. With a 10-man blind, they limit nearly every day. "I couldn't believe it. I didn't want to waterfowl hunt with nine other guys, but I looked out and my whole peripheral vision was full of moving flocks of mallards," Russell said. "There are little X's in this world and this boy has it. Ten people with limits by 10 a.m.," he says, "and they did that all but one day of the entire season." Pony up $600 for this dream hunt, with lodging and meals.